Now that it’s strawberry season, we present a very original recipe with organic white onion “sofrito”. Generously seasoning the pork loin and brown on all sides in a pan with a little oil. Remove the meat, spread with mustard and roast in the oven for about 20 minutes at 190 ° C and during the last 5 minutes, add the tablespoon of organic white onion “sofrito”. Meanwhile, in skillet, reduce heat to very soft strawberry vinegar, water, honey and half the strawberry puree, stirring with a wooden spoon. When missing a few minutes to finish cooking, add the reserved strawberries and cook for another few minutes. 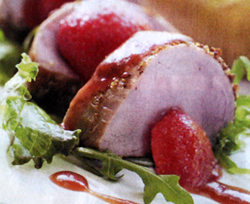 Cut the pork into thick slices and drizzle with strawberry sauce. Serve on a bed of salad and served with roasted potatoes.